Ryan Rowe got Brakes back on level terms on Tuesday evening. The goals will not win any beauty contests but that will matter little to Leamington who fought back from the shock of conceding in the second minute to gain a deserved win over Redditch on Tuesday evening, writes Paul Okey. Danico Johnson squeezed a header past Tony Breeden at his near post after being picked out by Liam Spink as the match started in lively fashion. However, the excitement quickly tailed off and it took until the 28th minute for either side to threaten again, Jack Edwards’ header drawing a smart save from Bradley Catlow. It heralded a promising 15-minute spell for Brakes with Catlow relieved there was no home connection on Tom James’ free-kick after he failed to make contact with his punch and Ryan Rowe inches from nipping in ahead of the keeper to collect an Edwards flick-on. 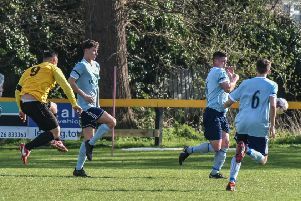 An ambitious Rob Thompson-Brown effort was straight at Catlow but despite the hosts’ dominance, they were fortunate to go into the break just one goal down after Johnson wasted a gilt-edged opportunity. Darren Pond was robbed inside his own half by Eli Bako, who slipped Johnson through on goal. But, with time to pick his spot, the striker never looked comfortable and shot too close to Breeden who got down to block and then recovered to claim the loose ball. The injured James was replaced by Connor Gudger at the break, while Redditch player-manager Darren Byfield’s race was run five minutes into the second period, with Javia Roberts coming on for his boss. It was a tetchy opening to the second period with a succession of poor challenges being matched by the standard of free-kick taking. After Thompson-Brown had wasted one such effort from a promising position inside the D, he got the ball back and picked out Ahmed Obeng, who crossed for Gudger to turn in. However, the flag had long since gone up. Duane Courtney headed a free-kick well wide for Redditch, but for large swathes of the second period the visitors were pinned back inside their own half by a rampant Brakes. With half an hour remaining Richard Taundry came on for the Zak Lilly, slotting into the centre of the park and ensuring there was no respite for an overrun Redditch midfield. Two minutes after his introduction Leamington were level. Thompson-Brown’s corner was met firmly by the head of Pond and despite Catlow producing a superb save down low to his right, the ball ballooned up and Rowe reacted quickest to bundle the ball over the line. Catlow was in action again shortly after, pawing a Taundry shot around the post and he was then out quickly to block as Hood tried to force the ball home at the far post from the resultant corner. Hood was again in the right place when James Mace skewed an acrobatic effort across the face of goal, but he was unable to get any power on his shot and Catlow gratefully claimed. A Gudger shot was parried away for a corner by Catlow and there was an anxious moment for Clayton McDonald as his defensive header went perilously close to his own goal with ten minutes remaining. However, Redditch were not so fortunate from the subsequent corner as the presence of Pond and Hood forced Jordan Jones to run Thompson-Brown’s delivery over the goal-line, with a jubilant Hood joining the ball in the back of the net.